The agenda was approved as presented by Eric at the meeting (slightly changed from the one circulated electronically). Minutes of Sept meeting were approved with one correction to the Chinatown web address. It was also approved that the minutes be circulated in about a week after the meeting, for approval electronically. This would allow their posting on the DCA blogspot before the next meeting. Moved by Archie, seconded by Maija. The proposal is to erect a 4 storey apartment building to offer affordable housing for low-income women and for low-income senior women. Cornerstone has been planning this project for 5 years, in consultation with the Councillor's office. Cornerstone is a Community Ministry of the Anglican Diocese of Ottawa http://www.ottawa.anglican.ca/cornerstone/ and the project was represented by Sue Garrey (director), Jane Ironside (consultant for minor variance application), Bill Prentice (Anglican Church), Anthony Leaning (architect) and Suzanne Harding (neighbour of an existing women's shelter run by Cornerstone). In the handout (see attachment) and the presentation it was emphasised that Cornerstone is looking for a long-term, stable place in the neighbourhood. 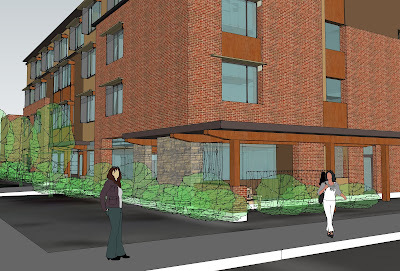 The proposal is for a 4 storey building, with 20 units for senior women and 22 units for women in need of affordable housing who may or may not have some disabilities. This building will offer permanent housing for its residents. Some services will be offered (dining, living room, kitchen) for the seniors and there will be an office on the main floor (thus the building will be mixed use that fits in with the zoning). The units will be modest studios, fully self-contained, some barrier free, with small kitchens. The residence will be staffed 24 hrs a day, about 10 staff and personnel care workers are expected to be on the site. Based on experiences of other houses run by Cornerstone, the shelter does not create any concerns and fits in very well with the neighbours and the neighbourhood. The footprint of the building will be slightly smaller than the current IGA and will have Booth Street (setback 4m) as its main frontage. Entry will be from the corner of Eccles (setback 3m) and it is designed to fit into the character of the neighbourhood (scale, materials used, etc). There will be a yard in the back and other outdoor landscaping and amenities. They aim for sustainable operations, hence the considerations of the community's needs as well as high efficiency heat and ventilation planned, insulation, high quality windows, trees planted, as much as possible environmentally healthy, local materials used with high recycling content.  parking lot (also bought old IGA parking lot) offers only off-site parking and does not provide sufficient parking for tenants and visitors (9 spots fewer than required). In Cornerstone's experience, most residents won't need any parking as they won't own a car thus the 20 parking spot available (using the old layout) will be sufficient. Underground parking would've increased the building costs by $0.5M but it is not unconceivable that the parking lot might be further developed at a later stage in which case there would be underground parking included. After the presentation it was decided that this project offers a much needed service and a welcome development on this corner. Thus the DCA will write a letter of support to the Committee (once the date is set) – moved by Zsofia, seconded by Maija. The last meeting was on September 24, neither Ida nor Charles could attend. The CCC reconfirmed that it plans to focus on: inter-provincial transit must be part of considerations; supporting rapid transit; value for money considerations; fair comparison of different options (eg DOTT vs surface train vs true hub-and-spoke system); study of Carling alternative route for LRT. Ida will present the CCC's statement at a Landsdowne-related meeting tomorrow, emphasising the need to situate such a development on a major transit route. John Verbaas of Action Sandy Hill has been elected as Chair, Cam Robertson as assistant chair. The document circulated by Eric is a collection of earlier blog postings by him – an attempt is made to pro-actively present a possible option for cycling route from Bayview to Dominion. Both the Hintonburg Community Association and Alex Cullen have expressed their support, while Paul Dewar raised concerns on the issue of preferring the modality of segregated bikelanes which is not in line with the city bike plan. Citizens for Safe Cycling is yet to be informed. Concerns are around whether segregated or separated bikelanes offer lower risks for cyclists and whether creating a separated bike lane for this location is the best use of funds when there are many neighbourhoods that are not connected to the bike system at all. At the same time, all segments of this route are due to undergo major rebuilding in the next 10 years, the aim would be to have this proposal for City to consider. The aim of tabling this proposal was not to seek DCA approval, rather to share something that is useful in development debates, such as DOTT, Carling-Bayview (soon to be revitalised). It was agreed that some sort of text would be very useful to allow the DCA promote the following aspects when talking to the City: to consistently consider cycling needs in all major construction projects, increase budget for cycling plan implementation, increased staffing. Eric to recirculate to the DCA the proposal for comments. Way finding signs have been put on the Queensway around 30Km away from Preston directing people to the Rochester & Bronson exits if they are looking for Little Italy or Chinatown. Ethnic designation signs will also be added so that visitors would move S on Rochester to Carling and enter Preston Street via the arch. Council to discuss on October 20. Boot will be detoured slightly to the West at old Wellington. DCA to write a letter requesting that there be a sign asking drivers to yield to cyclists, and that both pedestrian and cycling access should be maintained through the intersection at all time. There are city guidelines on cycling during infrastructure construction. Nothing new since June, Eric to follow up.  Domicile development on Spruce Street: an application has been submitted for the old office building facing Somerset next to the new condo development. $1M will be invested to turn it into a high-end office space for the next 20 years.  Infill on Elm, West of Preston, 56x100 lot, 4 townhouses proposed, each 1600 square feet, plus 4 parking. Same developer as on Pamilla recently, this is within the zoning requirements.  Farmers market: Lori contacted Diane, John Baird, Jim Watson, will contact Paul Dewar. Will do a site review of this 370K square feet site that has some structural concerns. Initially, the aim is to experiment with an open air market on the Gladstone end where there is parking. Acorn Farm is interested. A market can easily fit in with the long-term plans for this site (calling for the development of an office tower). PPRA wants to see the park expanded on the N end of the site in continuation with linear park on West.  Chinese Alliance Church: set to demolish 2 houses on Bell to make room for classrooms and parking ( their current parking is rented by many from the Health Centre). Meeting with proponent at 11:15 on Friday, Eric and Maija to attend. The DCA's position is that residential component on the site facing Bell must be maintained otherwise the current block is broken up.  Booth&Somerset (NW corner) parking lot application: no date has been set for this application yet. This parking lot blocks a very busy intersection as people try to enter/exit via Booth. The DCA is not in favour of surface parking lots. In any event, entrance should be as west as possible.  Fall Clean-up is moved to October 17, meeting at the Community Centre at 10 AM. There will be a note in The Buzz, though the delivery date is October 15.  PPRA report: there is a new city sign in the park.  Dominican Garden: no development, not sure who is the representative at the City, Decision from Dominicans whether to sell at all is expected October 2010.  Jane's Walk: Little Italy is already on the program, Eric to find out if there is an interest in adding more of the DCA catchment area. Lee Thorpe of Ottawa City Repair is the coordinator. Deadline is today, delivery next Thursday. Website is totally redesigned, now the whole issue there. Budget timetable was circulated (start on October 22, presentation December 9, public input in January, 28-29 deliberations by whole council) as well as information on the “plant your own tree” program. The Councillor to look into why there is an order for the demolition of the small garden at Lorne&Somerset. Charles distributed information on the upcoming AGM of Citizens for Safe Cycling at Tom Browne, October 20, 6PM.